Lamium maculatum – ‘White Nancy’ or ‘Dead Nettle’. 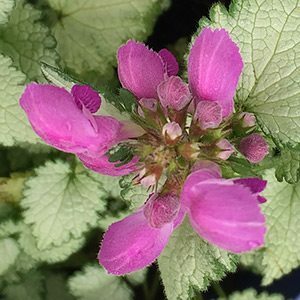 With very attractive foliage and either white or pink flowers, Lamium maculatum makes an excellent ground cover plant for a shaded position. Fast growing and a good all round plant for beneath trees you get a ground cover with good foliage and the added attraction of flowers. With a few common names including ‘White Nancy’ and ‘Dead Nettle’, it is the cultivars that are most widely used in gardens and landscaping. Flowers appear in summer appearing as terminal spikes, and will be pink, white or purple depending on the cultivar. This is a spreading plant, and overtime it sends out underground rhizomes and will colonise a good sized area. This is a very low care plant if planted in appropriate conditions. Although a moist humus rich soil is best, Lamium maculatum will cope with dry periods. In very dry summer sit can die back, however it will usually reappear as soon as it receives some autumn rain. As this is a fairly vigorous ground cover it does need an area where it will not crowd out smaller woodland plants. Excellent for underplanting Camellias and other shade loving shrubs. Planted amongst other tough shade loving plants such as hellebores it does well. It will tend to overpower primroses, G and smaller plants. Well suited to underplanting small shrubs grown in containers. Use it as a border on a shaded pathway or driveway. L. maculatum ‘Beacon Silver’ – Pink flowers with silvery green foliage. L. maculatum ‘White Nancy’ – Attractive white flowers. L. maculatum ‘Sensation’ – Deeper pink flowers. L. maculatum ‘Ghost’ – Silvery green foliage with pink to purple flowers. Position – Dappled shade to medium to heavy shade. Flowering may be restricted in very deep shade. Soil – Humus rich with some moisture. Spread – To 2m over time. We suggest pruning back by 50% each year to promote a more compact bushy habit. Easy by division of established clumps. 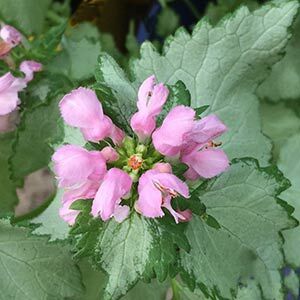 Lamium maculatum is available for sale online from the following nurseries.